A traditional favorite in the South, Crystal White Wax Onion is white-skinned with a mild, tasty flavor. It's perfect for eating raw, fresh slicing and cooking. 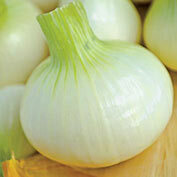 Also known as White Bermuda, this medium-sized, juicy, sweet onion is dependable and always mild and flavorful. Many gardeners also grow this variety to pearl size for pickling and cocktail onions. Exhibits strong disease resistance, including Pink Root tolerance. A short-day variety, it has a short storage life. Onions are affected by the amount of light they receive. Short-day onions begin forming bulbs when daylight lasts 10-12 hours. 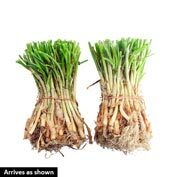 Often, they are the sweetest onions and the best for eating raw and in salads or lightly cooked in salsas and stir-fries. Because summer daylight hours are shorter in the South, short-day onions are most often grown in the South. 120 DAYS. Fruit: Thin, waxy, white skin. Firm, crisp, mild flesh. Slightly flat shaped, almost no neck. Seed Count: 84999 is about 150 seeds per pkt. 85000 is an offer of plants, 2 bunches of 55-75 plants per bunch. Comments: A traditional favorite in the south, this white skinned onion is mild, tasty and perfect for bunching and eating raw. Medium-sized, juicy, sweet onion. Always mild, flavorful, and dependable. Strong disease resistance including Pink Root tolerance. Short storage life. 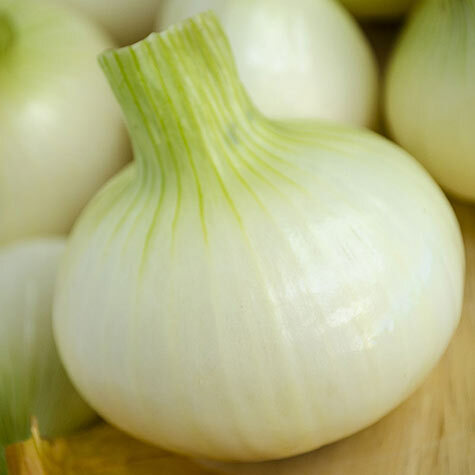 60 days will produce 3/4 inch diameter onions from seed, 92 days will produce Pearl-type (1 inch diameter) onions from seed, 185 days will produce medium size bulbs from seed.